“But none of these heads was as alarming, as shudderingly uttered as the head of the dying T. S. Eliot in the painting East Coker: T.S.E. In its gray-pink pallor, this head with its map of suffering, its Buddha ears, its final immobility, conjures the poem—the dung and death Eliot speaks of in The Four Quartets. 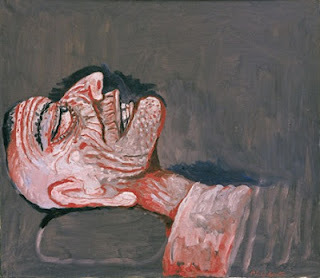 Guston perfectly parallels the mood of dry despair Eliot created in both "Burnt Norton" and "East Coker." He offers the genesis of his own thought in the painting. He tells us a secret about his entire oeuvre and the first line of "East Coker" holds the key: "In my beginning is my end…" Eliot's head on its stony ellipse of a pillow is a keenly alive but dying head. The eyes are widened, looking upward, and the mind is at work but terribly aware of the failing light. It is yet another reminder from Guston of the impossibility and yet the possibility of his art as a painter.